Photographed at Catalina Island using two Ikelite substrobe M's with a Nikonos 2:1 extension tube setup at f22. 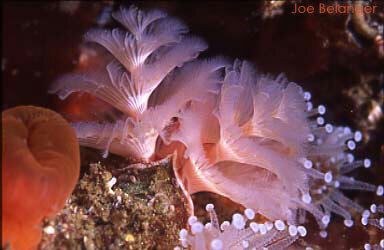 About the tube worm: Found on rocky reefs in areas where current is normally present. The worm's feeding tentacles protrude from its tube to catch drifting plankton for food. These worms come in many bright colors and are sometimes referred to as Christmas tree worms. Photographed at Begg Rock using a housed Nikon N90, Nikon 105mm 2.8 macro lens with +4 diopter and 2 Ikelite Substrobe 200’s. 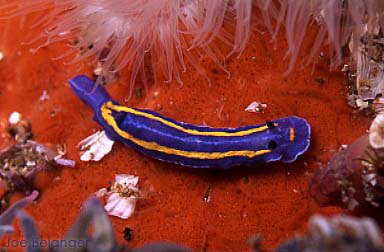 Exposed at f32 @ 1/60th . .
About: Beautiful nudibranch, feeds on sponge and is found in fairly shallow water. To 30 mm in size and range from California to Mexico. About: Photographed at Begg Rock in 40 feet. 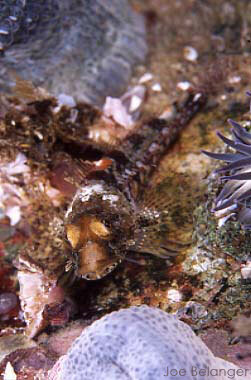 Many different species live in Intertidal zone to 100 feet and beyond. Range depends on species. Often easy to approach if you acclimate yourself to the animal. Photographed using two Ikelite substrobe M's with a Nikonos 1:2 extension tube setup at f22. 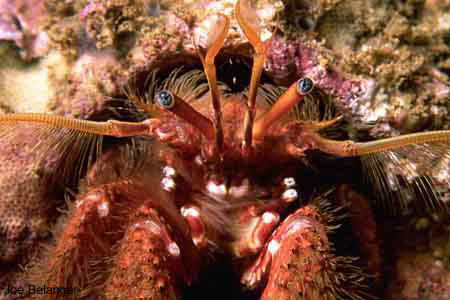 About the Hermit Crab: Photographed at Palos Verdes in 60 feet of water. Hermit crabs live in shells and are scavengers. This crab became attached to my framer and I had to pry it free to release it. Photographed using a housed Nikon N90, Nikon 60mm 2.8 macro lens and 2 Ikelite Substrobe M’s. Exposed at f11 @ 1/60th . About: Found in shallow water from 2 feet to 100 feet. 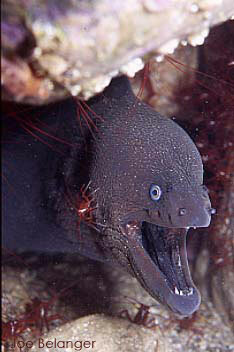 Lives in rocky crevices and rock piles either solo or in dens with other morays. Active at night and feeds on octopus, and crabs. The yawning they do is for respiration, not anger.